This painting is very characteristic of Courtens’s flowerpieces, with its abundance of blooms, impressionistic brushwork and harmony of colour. Reminiscent of Fantin-Latour’s flower compositions, it has the same delight in texture and varied surfaces – the glazed earthenware, the rucked tablecloth, the screen in the background – but is still innately a 20th century, rather than a 19th century, work. Courtens treated his paintings of female figures much like his flowerpieces, creating an overall colour harmony (for example, the blues in De verassing in the Groeningemuseum). 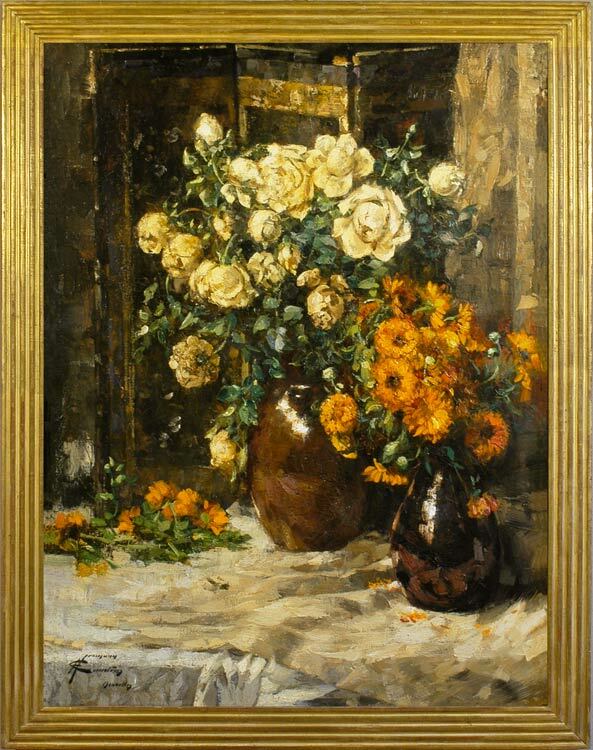 In the present picture the warm tones of the pitchers and marigolds are reflected in the neutral tints of the white roses and linen, producing a symphony of autumnal colours. Herman Courtens (1884-1956) was one of a dynasty of Belgian artists. His father, Frans (1854-1943), produced landscapes, seascapes and genre paintings, and is credited with founding the school of Dendermonde, whilst his younger brother, Alfred (1889-1967), was a sculptor, responsible for various public pieces such as the equestrian statues of Léopold II, in Ostend, and of Albert I.
Herman studied with his father and with Isidore Verheyden, became a teacher himself and later followed his father in becoming a professor at the Academy of Fine Arts in Antwerp. He specialized – as well as in still life paintings – in studies of women, children and animals. He was a member of the Order of the Légion d’Honneur. Both his sons, Jacques and Pierre, became artists.